Want to Set a Strategy Session, Have Questions About The Book or Course? Feel Free to Contact Us! We work with high performing managers who are ready move to their next level. As your partner, we help bring out your authentic leadership style. We quickly get you into action with clear goals, backed by a plan. We love challenges and finding ways through stuck places and persistent difficult challenges. We are straightforward, direct, practical, and honest. We know how to make intangibles tangible and how to measure success in a corporate setting. We will select and use techniques, models, and tools that are most efficient for you and your teams. Leading with gratitude is one of our secrets to making change easier. 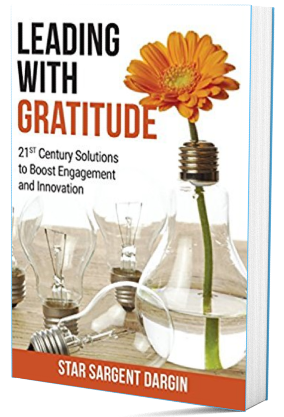 Sciences shows that when gratitude is part of a leaders foundation it create innovative, healthy, positive, forward-moving leaders and organizations. Leading with gratitude puts the focus on the right problems we need to solve and delivers better solutions. Gratitude is transformational, for individuals and business. Hiring us to coach you and your team is like having your personal leadership skill trainer. Our specialty is working with accomplished people who are ready to grow their careers, teams, and organizations. Successful leaders have a clear brand, vision, and are effective communicators. They know how to think strategically and can create and manage high performing teams. They are focused and can navigate through the complexity, chaos to produce tangible results. When you join we will send you a gratitude checklist and an excerpt from the book!